The European Heritage Days are the most widely celebrated participatory cultural event shared by the citizens of Europe. Held in September each year, EHDs events – often called Heritage Open Days – take place in the 50 countries party to the European Cultural Convention; this year, the days fall this weekend, Sept 24-25. During this time, doors are opened to numerous monuments and sites, allowing Europe’s citizens to enjoy free visits (or at a symbolic 1 euro) and learn about their shared cultural heritage, encouraging them to become actively involved in the safeguard and enhancement of this heritage for present and future generations. Italy is participating with many cultural sites holding special opening hours this weekend, particularly with longer or special hours on the evening September 24 and 25. Entrance will be a symbolic 1 euro. In addition, many entrance into the sites will include conferences, presentations, concerts or other shows. Sept 24 – Special opening 19:30 – 22:30. At 4pm, conference on the studies and projects at the museum; at 9pm, a musical concert from the “solisti del Liceo Musicale”, from Liceo Classico Musicale “F. Petrarca”. Sept 24 – Special opening 7-10 pm and historical readings. The Accademia Gallery will prolong its opening hours on Sept 24 from 7 to 10pm. Between these hours, entrance will cost 1 euro. On Sept 24, longer opening times at the Uffizi from 7 to 10pm at the symbolic entry fee of 1 euro. On this evening, under the Loggia of the Uffizi, between 7pm and 9.30pm, the choral group “Animae Voces” will hold an a cappella concert of music from across the world. – National Museum of the Bargello, full price € 8, reduced € 4. – Medici Chapels, full price € 8, reduced € 4. – Museum of Palazzo Davanzati, full price € 3, reduced € 3. – Museum of Casa Martelli, free entrnace. Only on Saturday, Sept. 24, the Bargello will hold a special opening from 8-11pm with entrance being a symbolic € 1. – at 4pm at the Bargello: “Ritratti di Signore”, an extraordinary visit with the Museum Director, Paola D’Agostino, also included in the entry ticket. 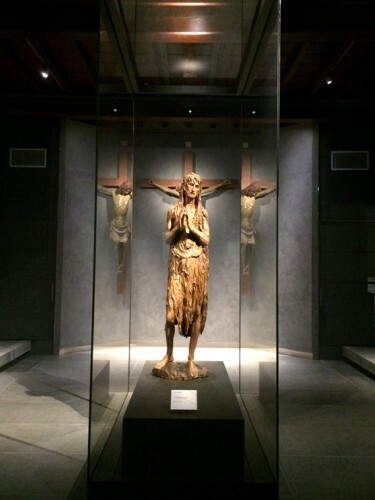 On both Sept 24 and 25, at 5pm, you can join in special guided visits (free) of Donatello’s Magdalene within the Opera del Duomo Museum with new details after its recent restoration. You will need to pay the museum entrance fee to be able to participate; the visit will be held in Italian. Sept 24 and 25 – at 12pm, guided visit of the last supper. Sept 24 and 25 – from 2.30-6.30pm, an event called “The Garden of the Bizzarre” which will include music, literature, art and nature, in collaboration with the Comitato Giovani Unesco, LAAV, Toscana Music Pool, Angeli del Bello. Sept 24 – Special opening 8-11pm with possibility to see the rooms in which Maria Maddalena dei Medici lived in. Sept 24 – Special opening 8-11pm and meeting “San Marco before and after the Medici” with special opening of the Chiostro Silvestrini and visit to Maria Maddalena dei Medici’s tomb. Sept 24 – Special opening 7-10pm and at 8pm, theather show “Pinocchio at home”. Sept 24 – Special opening 8-11pm and at 16:30 presentation of the “Sacred and profane furnishings from the Bardini collection: Restorations and new displays” curated by Cristina Gnoni Mavarelli with participation by Simone Chiarugi. On Sunday, Sept 25 at 4.30 (with advance booking), anyone can join in the guided visit to the Palazzo dei Vicari. The visit will include the atrium, the rooms on the Noble floor which is currently hosting the exhibition “Knives from the Horn of Africa” and entrance to the Historical Archive, normally closed to the public. If weather permits, the visit will also include a climb up the battlements from which you can view the town of Scarperia and surrounding lands. Free, but reservation required at 055-8468165. Sept 24 – Special opening 8-11pm and from 10am to 2pm, guided visits to the archaeological area with presentation of ongoing digs and research with Florida State University and the Università di Firenze. Sept 25 – from 10am to 2pm, same as above plus the presentation of two books, one a guide of Cosa for Kids and another on the archaeological sites between Cosa and Orbetello. Sept 24 – Special opening 7.30-10.30pm with a presentation at 5pm of the painting by A. Bellucci “Allegory of Time” by Stefano Casciu, Director of the Polo museale della Toscana. Sept 24 – Special opening 8-11pm + presentation of the research on the Oratory by Francesca Fedeli. Sept 25 at National Museum of Chiusi between 10am and 2pm, visits to the Tomb of the Pellegrina, in collaboration with UICI and Associazione G. Selleri.